This is our THIRD attempt on Sleeper. Back in November we tried two Saturdays in a row to bag the peak but turned around because of difficult water crossings on the Sabbaday Brook Trail. Incredibly frustrating experiences - Attempt #1 and Attempt #2. But, no doubt about it, today is the day! We have chosen a different route so we won't have to worry about water. We are climbing up the Livermore Trail to the Tripyramid's South Slide. We leave Keene at 7 a.m. - a completely luxurious morning for us - and set out on the Livermore Trail at 9:30. Not more than 10 steps on the trail and we are exclaiming to each other. "Pat look at the flowers!" 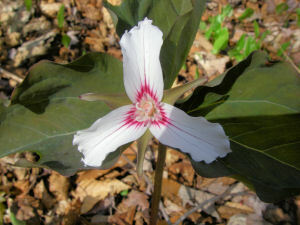 "Oh, look at the trillium!" "Hey, wow - look, they are everywhere!" "I gotta get a picture." We are completely dazzled by the wildflowers gracing the trailside. 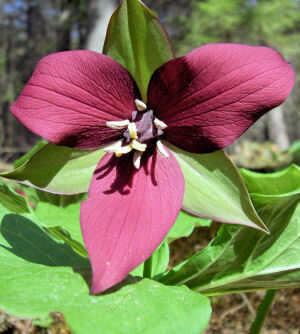 We see painted trillium, wake robin trillium (crimson color), trout lily, red-stemmed violet, common blue violet, common strawberry, wood anemone, woody blue violet and hobblebush, all in bloom. Our eyes wonder back and forth from one side of the trail to the other, cameras at the ready, spotting one beautiful flower after another, and pointing them out to each other. We look like little kids on a chocolate Easter egg hunt, spying the next blossom and running over to get a picture. It's just that we're saying, "Beautiful!" instead of "Yummy!" If I was alone, I wouldn't be exclaiming out loud about the beautiful wildflowers, getting more and more excited by each one. I wouldn't let it out; I'd hold my enthusiasm a prisoner inside. I would miss out on the fun and wonder of saying it out loud, hearing the excitement in my own voice. And I would miss seeing Pat's face as she receives my contagious enthusiasm and lets it expand her own. Sharing the experience makes it bigger, it multiplies the joy in an exponential way. We feed off each other's enthusiasm and before we know it we are filled with delight. The wildflowers lead to a conversation about how we are blooming too. Both Pat and I are sticking our feet out and testing the waters of life in new and different ways, like the wildflowers, slowly opening to the world. In my last trip report I shared the story of finding my birth mother, a story I have held inside for 20 years. But I am realizing there is a gift in the sharing. If I hold it inside, no one really knows me. I am a secret. If I share, I am visible; I am out there for the world to see. It's a bit scary. But I have been so touched by people's responses to my story of finding my birth mother. And in their responses, I have felt seen, seen for who I really am. And there is just no greater gift than that. Being seen makes me want to open more, to let my light shine more freely, to bloom more fully. Now, I'm in my 50s, so you'd think I would have already bloomed and was on the way out. 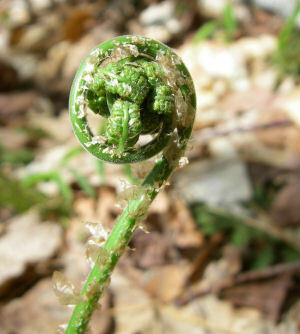 But maybe Pat and I are perennials in a constant growing, blooming, and dying cycle. Ahhhhh, that feels right. And each time I bloom, I am more fully me. 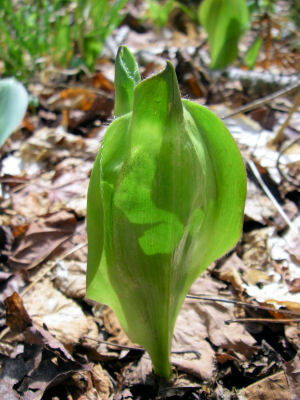 Once over the initial wonder of being surrounded by wildflowers, we start noticing that some of the clintonia have sprouted, but dead leaves from the fall encapsulate the new growth. 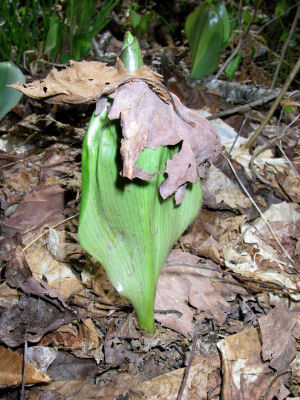 The plants are growing right up through the brown dried leaves, but the new leaves are bound together, unable to open, and unable to bloom. "Save me! Save Me!" Pat says, speaking for the clintonia. We start pulling the dead leaves off the plants, freeing the green blades, allowing them to relax into their natural state. Huh, it's like Pat and me. In order to bloom we have to first rid ourselves of any old patterns or thoughts from the past that might be getting in the way of our living today. I call it baggage and my husband is always saying to me, "Let's unpack that bag, Nance." My baggage is the way I learned to cope as a child - I tried to be invisible. It worked then, but trying to be invisible doesn't serve me anymore. The day came when the risk to stay invisible was more painful than the risk to be seen, and so I shared the story of finding my birth mother publicly. "Ahhhhh...Thank you," the clintonia seem to be saying as I strip away the dead dry matter and the plant's leaves unfold and unclench, allowing the sunlight to enter its center. It would be easy to hike by and not notice the clintonia encumbered with dead leaves. But we're engaged with the world when we're hiking and it feels like a two-way trail. Freeing the flowers is a way to give back and say thank you to mother nature who showers us with incredible beauty every time we step out of the car and into the woods. As we de-leaf we look at each other and laugh at what we are doing. We're sharing the joy of saving clintonia. I don't think I would be taking dead leaves off of plants if I were alone. Having a co-conspirator helps me not take myself so seriously. Having someone to play with brings out the kid in me. I am happy. So is Pat. As we take a right onto the Tripyramid trail we have a blue-sky moment. The forecast for today is cloudy with a chance of showers before 8am, a chance of rain between 8-2pm and then cloudy the rest of the day. But we decide to hike anyway, desperate to be in the mountains. "It has turned into SUCH a beautiful day!" "I was prepared to walk in the rain." "Oh, we are SO lucky!" As we start up the south slide, we meet Marty, a VFTTer who recognizes our names. How cool is that! We ask him, just to be sure, which Sleeper is the one that counts for the 100 Highest, east or west. "That's where we are headed," Pat says. "Well, then, let me tell you two things." Marty says. "There's lots of deep snow up there and I got turned around, lost the trail and ended up adding 2 miles to the hike. So be careful." "Did you do a lot of post holing?" I ask. "No, I've got snowshoes." he says. Pat and I look at each other. Uh oh. We decided not to bring snowshoes because we lugged them up Chocorua last weekend and they stayed on our packs all day. So we figured we wouldn't need them. Whoops! It looks like we are in for an adventure! We get to the junction of the Kate Sleeper Trail around noon and have lunch. While we are enjoying our sun-and-sandwich bliss moment, we talk about our destination. Pat thinks West Sleeper is on the 100 Highest list. I check the map and agree. West Sleeper is 3,881 feet whereas East Sleeper is only 3,840 feet. The list is the 100 HIGHEST - so wouldn't you think that it would be the higher mountain? This is important because East Sleeper is another 3/4 of a mile beyond West Sleeper along a snow-filled ridge. We decide Marty is wrong, and we head up to West Sleeper. First we have to go down a slide - and I HATE going down when I am supposed to be going up. But I manage to control myself and before I know it we are heading back up. Then we hit the snow. At first it is doable, but before we know it, we are post holing through 1-2 feet of rotten snow. The second we take a step and put weigh on our foot, down we go, plummeting into the freezing cold, filling our boots with ice crystals. But we've come this far, so we keep going. Here's the good part. We are laughing at ourselves. Shorts on, bare legs, wet boots, soaking socks, struggling to extricate ourselves from one hole after another without falling and plunging our bare hands into the snow. What else can we do but laugh? Yet, had I been alone, I might have been swearing to myself. With Pat there, I seem to find the humor in our situation more easily and laughing feels like a bonus. We reach the unmarked summit of West Sleeper and gratefully turn around. We get back to the slide and find a hot rock in the sun. We take off our boots, wring out our socks and air out our feet while we enjoy the second half of our sandwiches. The view is spectacular. Pat points out the mountains we've climbed and we relive our hikes on each of them as we rest in the sun. "There's Welch-Dickey. We hiked Welch Dickey the same day we turned around on our first Sleeper attempt. Remember I thought we had summitted both mountains and then realized we had another mountain to go?" I ask. "There's Sandwich Dome," says Pat pointing. 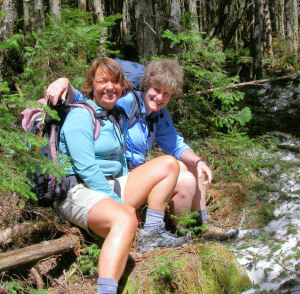 "Wasn't Sandwich Dome our first winter sliding hike? We laughed and whooo-hoooed all the way down the mountain!" "Remember Tecumseh?" I say. " I barely made it up in the summer and in the winter I took a header while we were talking to a guy on the trail." We laugh. Both of us are smiling, nodding, remembering. Life is pretty cool the way it works. First we get to share the experience and the joy when it happens and then we get to hold it in our hearts, available for reminiscing and feeling again any time we want. And, oh! I forgot! Even before the experience, we get to anticipate it! We finally put on dry socks, wet boots and head down the slide and out Livermore Trail. We walk down in a Passaconaway. A what, you ask? A Passaconaway. On our very first 4,000-footer hike, coming down Passaconaway, we were blessed with a beautiful afternoon just like this, perfect temps, warm sunlight, and soft breezes. I remember I was exclaiming most of the way down, "Oh, this is SO beautiful!" We have always remembered it. We are reveling in the Passaconaway even as we are losing a bit of the spring in our step. It seems trail workers have added a few extra miles onto the end of the trail when we were post holing on Sleeper! We get back to the car at 5:45 and to my house in Keene at 8:30. I immediately sit down at my computer and pull up the "100 Highest" list. It's East Sleeper. Marty was right. We climbed the wrong mountain! You know, there's no failure in our attempts. They give us a chance to try again. And climbing another mountain is another opportunity to bloom more fully. It is another invitation to follow the examples set by the trailside trillium and let more of my beauty emerge by sharing more of myself. The wildflowers beckon all of us to allow ourselves to be more easily seen by shining our lights a bit brighter. When we do, we make it easier for others to bloom around us. And the best part - Pat and I get to share our wonder and joy. I radiate it out into the world. Pat catches it, feels it, and mixes it with her own. I see it emanating from her face as she smiles and it comes back to me.